Imagine, you have devised a new strategy and decided to execute it within your organisation. To ensure successful implementation, it is important that your employees understand the new concept. How can you achieve that effectively? You could of course share your insights with your team through a PowerPoint presentation. But serious gaming takes you a step further, and delivers significantly better results. Allowing your employees to experience new concepts and explore ideas for themselves is an extremely effective method! It enables you to influence not only their knowledge but also their attitudes and behaviour. The game makes the impact and results of their decisions immediately visible. It is fantastic to see what your team can learn in just half a day thanks to serious gaming. 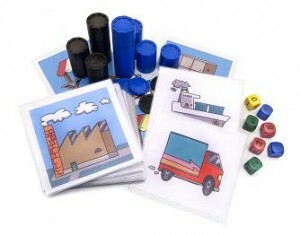 Exploit the educational power of a game – because your business is certainly not child’s play. As a supply chain management team, playing The Fresh Connection business game provides you with a wealth of experience. Collaboration, both internally and within the supply chain, is the key to success. Supply chain management forms the basis for healthy profit. Supply chain risks must be managed. It is essential to keep an eye on the ever-changing environment. As a (logistics) manager, you face countless choices – at strategic, tactical and/or operational level. Centralised or decentralised organisational structure? Close to home or further afield? Direct or indirect sales? Push or pull? Make to stock or make to order? The Supply Chain Game allows you to explore the various options risk-free, discover their impact and share your insights with your team at the same time. This business simulation is a guaranteed eye-opener! Your manufacturing environment is a dynamic one. Sounds familiar? Customers placing rush orders. Production lines battling with technical problems. Suppliers delivering late. How can you create more stability? How can you increase delivery reliability while reducing costs? How can you balance supply and demand? You often cannot put a value on spare parts: if the right ones are not available at the crucial moment, your machine or even the entire factory can grind to a halt. Therefore, when managing spare parts, you look at your choices in a different light. How vulnerable is your supply chain? And which risks do you need to take into consideration? Supply chain risk management continues to gain in importance. Outsourcing, concentration, globalisation, international transparency and ultra-fast information transfer are all increasing the vulnerability of your supply chain. Make sure that you take a systematic approach to such risks. Above all, be proactive. Reduce the chance of a risk occurring and/or minimise its consequences.